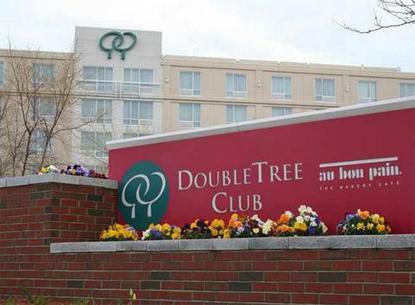 The Doubletree Club Hotel at Boston-Bayside and Bayside Executive Conference Center is situated next to the Bayside Expo Center, less than four miles from Logan International Airport. Our convenient Bayside hotel is within walking distance of The JFK Library & Museum and the U Mass Boston campus, and is less than two miles from the heart of downtown Boston.Ideally located for business or leisure travel, our warm, comfortable hotel offers ocean and city views from the top floors. For your ease and comfort, the Doubletree Club hotel provides complimentary shuttle service to Logan Airport, Boston Medical Center, and downtown Boston. Our nicely appointed guestrooms, suites and executive accommodations boast a long list of amenities, including wireless high-speed internet access. Work out in our on-site fitness center, relax over cocktails in the lobby lounge, and enjoy the freshest pastries and light fare at our Au Bon Pain bakery caf?, serving breakfast, lunch and dinner daily.We offer a full slate of amenities with the business traveler in mind, including a well-equipped Business Center, an inviting Club Room, and over 19,000 square feet of flexible meeting, ballroom, and exhibition space. Our professional staff can provide meeting planning, tech support and state-of-the-art video conferencing and presentation tools for your important function. Our dedicated catering department will make your group event - from luncheon seminar to formal reception - a spectacular success.The Doubletree Club hotel at Boston-Bayside is easily accessible to all areas of Boston, with a Redline "T" station just across the street. Be in the historic North End, Boston's Financial District, the Theatre District, Chinatown, Beacon Hill, Back Bay or Fenway in minutes. Visit Beantown's favorite attractions, like Faneuil Hall, Boston Common, the New England Aquarium, or the Old North Church. Whether your stay involves work, play or weekend getaway, our friendly and courteous hotel staff looks forward to welcoming you to Boston's Bayside with our very special, signature warm chocolate chip cookie at check-in.